Below are some ideas you can use in your local nonpoint source pollution mitigation project outreach efforts. If you have a unique idea that you would like to share, please contact us! Using this activity, students have an opportunity to compare urban impervious environemnts to natural pervious environements. Using the models students calculate, graph and compare the hydrographs from these two types of watersheds. After the activity students have a better understanding of how urbanization increases runoff and pollution to local streams and water bodies. Signs along walking paths are a great way to engage interest in issues. Signs are posted by Logan River, Provo River, Red Butte Creek, and in Grand County's Pack and Mill Creeks. Several of these have a datasheet attached for local volunteers to show their data. 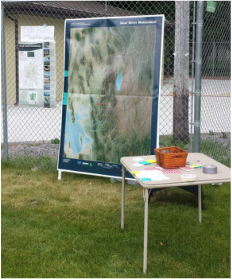 If interested in adapting these signs to your area, contact USU Water Quality Extension, waterquality@usu.edu. Stream trailer available for check out from the Department of Environmental Quality in Salt Lake City. For more information, go here or Jim Bowcutt to check on availability.